From 1898 to 1925, the internationally acclaimed magician Harry Houdini appeared in Maryland on multiple occasions, performing nearly every one of his signature acts, stunts, lectures and shows. Ninety-two years after his death (on November 4, 1926), Houdini returns to Baltimore in a Jewish Museum of Maryland original exhibit, “Inescapable: The Life and Legacy of Harry Houdini.” It tells the story of how Ehrich Weiss, a Hungarian Jewish immigrant, transformed himself into Houdini — an international superstar. The exhibit was curated in just nine months, when the average show takes about two years to put together. It features dozens of artifacts, photos and archival records, many on loan from public and private collections. Born in Budapest and named Erik Weisz, the future Houdini emigrated with his family to the U.S. at the age of 4. His father was hired as a rabbi in Appleton, Wisc., but later lost his position, forcing the family to seek opportunities elsewhere. As a young teenager, he also became interested in magic, performing for small groups. 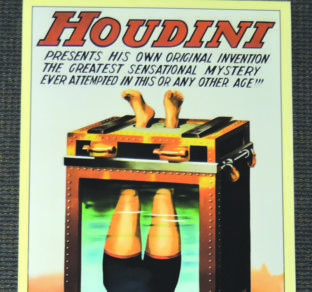 Eventually he adopted the name Houdini in honor of his idol — a French magician by the name of Jean-Eugene Robert-Houdin. Houdini went on to become known worldwide, even performing in Russia in the early 20th century. Known for his illusions and stunts, Houdini left a legacy that lives on, thanks to countless biographies, articles, films, television programs, and museums dedicated to him in New York, Los Angeles, Budapest, Scranton and Appleton. The exhibit, which runs until January 21, features six themed sections, ranging from “Setting the Stage,” about his early life and the family’s difficulties, to “Houdini in Maryland,” spotlighting his nearly 100 performances in the state during his career. The exhibit includes a wide-ranging display of reproduction posters, photos and press clippings, as well as original apparatus — including a straitjacket and milk can that were used in his performances. Marvin Pinkert, executive director of the museum, an agency of the Associated: Jewish Community Federation of Baltimore, explained that the exhibit not only deals with Weiss/Houdini’s extraordinary career on the stage, but also gives visitors a look at the influences and causes that shaped his life. “It will give visitors a deeper understanding of how the Houdini story fits into the saga of Jewish immigration in the late 19th century, and how the technological innovations of his time enabled his rise to stardom,” he said. Perhaps surprisingly for someone known as a master illusionist, Houdini was a crusader against deceptive spiritual mediums, whose rise in popularity coincided with the end of World War I.
Grieving families were desperate to hold on to their loved ones in any way they could, and were taken advantage of by those who claimed to be able to communicate with the dead. Much of Houdini’s later life was spent exposing these people. Houdini’s most famous appearance in Baltimore took place in 1916 when close to 50,000 people gathered to watch him escape from a straitjacket while hanging upside down in downtown Baltimore. It’s not generally known that Houdini was also a pioneer of early cinema. He filmed many of his death-defying escapes, ran his own motion picture studio, and starred in several movies. Included in the presentation will be the true story of a plane crash caught on film during the making of Houdini’s most successful movie, The Grim Game, as well as dozens of rare photos and film clips. A screening of The Grim Game will follow the talk at 2 p.m.
Museum admission, which includes the exhibit, is $10 for adults ($8 for those 65+). For more information, go to www.jewishmuseummd.org or call (410) 732-6400. The Jewish Museum of Maryland is located at 15 Lloyd St. in downtown Baltimore.